Bitcoin Press Release: Digitex Futures Ltd, a commission-free cryptocurrency futures exchange, presents its first ever live demo of the exchange, and announces partnership with Ethereum’s core Plasma development team, Matter Inc.
31st October, 2018. Providence, Seychelles. As Digitex Futures prepares to attend the Malta Blockchain Summit this week, where Todd will be speaking about Plasma, the Ethereum blockchain and its impact on the Digitex exchange, delegates will have the chance to watch the unveiling of the live demo of the exchange for the very first time. With the launch date of Version 1 of Digitex Futures set for December 2018, the Malta Blockchain Summit will be the very first time that the company reveals its capabilities to the trading and investment world. To be among the first to test drive the Digitex platform, sign up for the Early Access Waitlist, currently at over 400K signups. The first 5,000 on the list will receive 1,000 DGTX to be able to try out the features on the futures trading platform for themselves. To get bumped up the line to the first 5,000, simply refer a friend. Out of thousands of potential candidates, Digitex has been selected as one of the very first companies to incorporate Plasma into their technology stack and the only hybrid cryptocurrency exchange that will offer this cutting-edge solution. Unlike other cryptocurrency exchanges, Digitex Futures allows users to buy and sell Bitcoin, Litecoin, and Ethereum futures contracts entirely commission-free. All profits and losses are denominated in the exchange’s native token, DGTX, which has cemented its position among the top 100 cryptocurrencies after displaying consistent growth in recent weeks. Plasma technology will allow the Ethereum blockchain and the countless applications (DApps) built upon it to scale to a mass audience. As a system for opening and maintaining side chains that allow for potentially billions of transactions to happen off-chain, the ramifications of Plasma will be huge for the industry. Digitex Futures will be among the first selective group of groundbreaking companies that will help to onboard more users and cross the chasm to mass adoption of cryptocurrencies. The DGTX token has recently been added to the HitBTC exchange. Being one of the crypto exchange market leaders, HitBTC pays special attention to the trends, technologies and requirements that influence the industry, and provides substantial support to its flagship developments. For more information about Digitex Futures, visit https://digitexfutures.com/ and to purchase a ticket for the Malta Blockchain Summit, visit https://maltablockchainsummit.com/buy-tickets/. Digitex Futures Ltd is an International Business Company (IBC) located in the Republic of Seychelles. 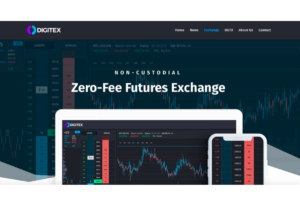 Founded by a former futures trader and betting-exchange trader, Digitex has developed a revolutionary new token issuance revenue model for sustainably operating a futures-exchange without charging any transaction fees on trades. Digitex Futures Ltd is the source of this content. Virtual currency is not legal tender, is not backed by the government, and accounts and value balances are not subject to consumer protections. Cryptocurrencies and tokens are extremely volatile. There is no guarantee of a stable value, or of any value at all. Token sales are only suitable for individuals with a high risk tolerance. The post Digitex Futures Presents Its First Ever Live Demo at Malta Blockchain Summit appeared first on Bitcoin PR Buzz.